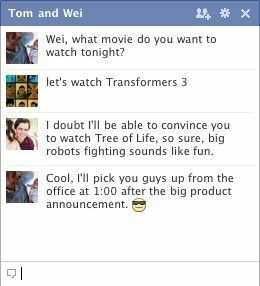 FB Announces New Chat; What's Next On The Cards? The writing on the wall had been read for over a week now. 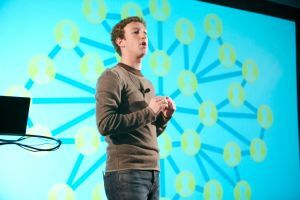 Facebook is planning something new, its young founder Mark Zuckerberg had teased about a week ago, around the same time when arch-enemy Google announced Google+ and analysts speculated that it would be video-calling. It is so; plus, there is more. At a Press conference in the company's headquarters in Palo Alto, the social networking company announced the launch of group chatting, video-calling capabilities straight from the browser and a new interface for FB chat. The company is rolling out its services gradually over the next few weeks, but if you would rather have it right now, please click here for the video plug-in. The Facebook video-calling plug-in installation just takes two clicks and does not require you to download and install Skype in your machine (incidentally, Skype is what powers the call). The new chat design includes a sidebar that lists the people you message the most. You can also create instant group chats by just adding more users to the conversation. Another interesting feature is â€“ you can leave a video message (something that Gmail or Yahoo! Does not let you do yet). Currently, the service is available in more than 70 languages across the world. But it cannot connect to G-Talk or iChat for that matter. Zuckerberg did not rule out the possibility that there may be a multi-user video chat coming up in the near future. If you call friends who don't have web cams, they will be able to see and hear you but you will only be able to hear them. Currently, the browsers supported are Mozilla Firefox, Google Chrome, Internet Explorer and Safari (read, all major browsers). However, video calling for Linux is not supported (Sorry, Linus Torvalds). We did a test run of the video call, and found the call quality crisp and the video clear. The chat interface was still its old self, peppered with green dots and grey half-moons; so maybe we can expect some tweaks on that. Incidentally, Philip Su, an engineer on the video calling team, made the first video call to his parents back in Maryland. We do not know if the words 'Mary had a little lamb' entered the conversation. Facebook announced a new messaging system in November last year, providing, among other things, @facebook.com e-mail address for users who wanted it. With this move, Facebook became an e-mail provider overnight, a direct threat to others in the field â€“ most notably Gmail, Yahoo! mail and Hotmail. If the company wants an initial public offering, sooner may be a better time than later. Those who have been able to access Google+ love it and when it will be open to all, it will surely grab our attention. Currently, the average Facebook user has around 130 friends, and collectively spends over 700 billion minutes a month on the site. But do remember that Facebook's $70 billion valuation is based on its uniqueness and audience base. With Google+ in circulation (in which, ironically, Zuckerberg has the highest number of followers at the moment), both of these might be at threat. While Facebook may not become an endangered species like the T-rex or MySpace or Friendster or Plaxo, its popularity and valuation may take a significant dip. Then, there is the saturation point. The rate at which new users are joining the site may be hitting a plateau now, after traversing a swift J-curve. The company had 150 million active users in January, 2009, and by April, 2009, the number had reached 200 million. In December, 2009, Facebook reached 350 million users. The numbers kept escalating â€“ 400 million in February, 2010; 500 million in July and now it stands at 750 million, said Zuckerberg. In the meanwhile, advertising budget is also finite. Since the site is free, Facebook's source of revenue are advertisements and cut-offs from apps. Besides, privacy is still a thorny issue that Zuckerberg has not been able to resolve completely. There is no immediate cause for concern, though. A quick look at some numbers shows that people on Facebook install 20 million applications every day. And every month, more than 250 million people link up with Facebook on external websites. Since the social plug-ins have been launched in April, 2010, around 10,000 new websites integrate with Facebook on a daily basis. And more than 2.5 million sites have integrated with Facebook till date. It is the fourth most-visited site on the Web according to comScore, and has the first-mover advantage. Plus, not all our existing Facebook friends may migrate to Google+. So we will be availing Facebook's services for the foreseeable future. Facebook and Microsoft are allies. When you search for something on Bing or Facebook Web results (which is also powered by Bing), you will be able to see your friends' faces next to the web pages they have liked. However, along with Facebook, the Redmond giant also has a deal with Twitter, whereby the status updates or live feeds get integrated near real-time with Bing search. Incidentally, Facebook has more status updates than Twitter in a given day. The question is â€“ although the Skype integration will help Facebook, how will it help Microsoft? Besides stealing the competition thunder, that is.